The Stocking Stuffers for Seniors campaign currently underway at London Drugs stores across Western Canada with a goal of supporting 15,000 seniors in total this holiday season! Shopping for others is one of my favourite parts of the holiday season. Selecting something from someone’s wish list, knowing they’ll enjoy the thought and the item, gives a warmer, fuzzier feeling than a festive mug of hot chocolate. 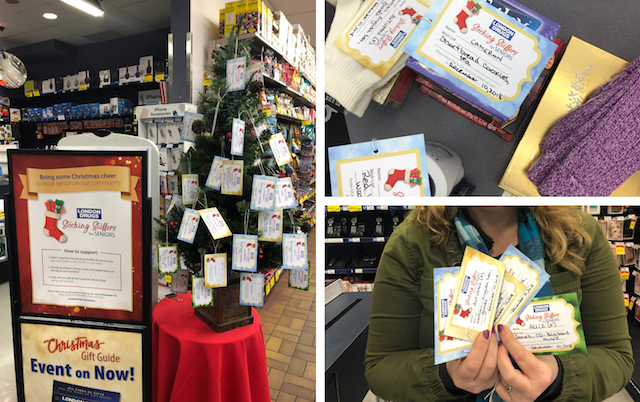 Stocking Stuffers for Seniors is a customer-driven donation drive in which people can visit their local London Drugs, choose a tag from the tree that contains the personalized wish list of a local senior. The gifts are then delivered to the seniors before Christmas. Just the act of receiving a gift helps to significantly improve the spirits of a senior and can have lasting mental and physical health benefits. The donation drive concept originated in BC’s Okanagan and expanded to Edmonton in 2015 with a goal to help 40 low-income seniors by providing them with simple gifts such as food, hygiene products or warmth items. The campaign has grown quickly to now include all 80 London Drugs locations in 35 cities across Western Canada. Since the campaign started, gifts for approximately 14,500 seniors have been delivered. The Stocking Stuffers for Seniors is a great way to connect with another generation and support our elderly. Isolated seniors is an epidemic in Canada – 1.4 million seniors report feeling lonely. Stocking Stuffers for Seniors is a small way we can brighten the spirits of lonely, isolated and low-income seniors at the holidays. Santa and his elves will deliver your gifts to your senior(s) before the holidays! I spent some time at my local London Drugs picking up items for a few seniors whose wish lists hung on the store’s Christmas tree. It was like a store-wide scavenger hunt to find the requested items, and it actually felt really special to pick out items as a gift for someone. Tea, socks, lipstick, a CD, a scarf, or a box of chocolates. Such seemingly simple items can have such a huge impact. I think Garfield the Cat put it best when he said, it’s not the giving, it’s not the getting, it’s the loving! Show a local senior that someone cares about them by participating in this program at London Drugs, on now until December 9th. Follow London Drugs on Facebook, Twitter, and Instagram for more information about #StockingStuffersForSeniors and their many other community initiatives. I didn’t know this was a thing – this is lovely, I’m excited to find a tree in my local LD and do some shopping! I thank you for preparing refill my prescriptions own time.I’ll be come again.